This is our new Pet. Her full name is LOLA, 30% OFF. The first thing you need to know about Lola is, she's evil. The second thing you need to know is YES she was 30% off but that wasn't why I bought her exactly. Lola has not been handled a whole lot--so sometimes she hisses and bites (but it's really more like a pinch). You'd hiss and pinch too if you had to live in a glass box that was way too small for you. Lola is a Chameleon and she isn't supposed to live in glass--and she was returned once already so she was really to large for the place she was living. I had planned on buying an Iguana, but I became moderatly obsessed with the fact that the wrong sort of people might take Lola home--and that she'd end up being returned again. Trust me, she's much happier in my office in her large all mesh habitat, with real live plants, dripping water, and humidifier; and even though I HATE bugs. I managed to feed her a couple of crickets this morning before making the man take over. I'm a good lizzard mom; but I can't help but thinking that LOLA, 30% OFF would make an awesome book title. BTW, I uploaded Heroes & Vallenez; expecting to make the announcement about it being live tomorrow but for you adventurist types it will be up soon. Expect to have another giveaway for those who help me spread the word it starting Friday. Until then you still have a few more days to enter to win a Kindle Fire HD--HD because we had more than 500 entries! Thanks to you guys who helped me spread the word! She's lovely, and I hope she settles in with you soon. I love iguanas, but I don't have one.. Jules was an iguana I almost adopted, but sadly it was not to be. He did go to a happy home. Best of luck with Lola-30% off. Aww look at Lola!! I love iguana's!! I have always wanted one. Lol! And I totally missed how she's a chameleon and not an iguana. 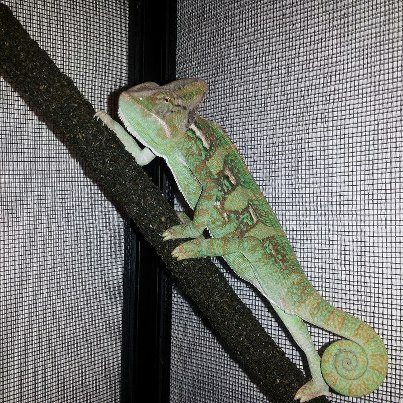 I have never seen a real chameleon, but my friend had 2 iguana's and that's why I wanted one. Lola 30% off sounds like an awesome title. I'm glad Lola 30% Off didn't fall into the wrong hands. for a tremendous post and a all round entertaining blog (I also love the theme/design), I don't have time to browse it all at the moment but I have bookmarked it and also included your RSS feeds, so when I have time I will be back to read much more, Please do keep up the excellent work. What kind of book would have the title "LOLA, 30% OFF?" A Diet book, maybe. Something involving a skill-set that was always off by 30%, like archery or target shooting, perhaps. Maybe a women named LOLA that was 30 percent off her rocker? I agree that it would make a great title, but for what kind of book? What are you thinking? And, when is the book coming out? I'm sold. Really love the idea of Lola, 30% off as a book title, as well. Seems to hold some intriguing possibilities!